Your area rugs are not always the same as carpet when it comes to cleaning. Many area rugs are made of different material than standard wall to wall carpet. The dying process used in manufacturing may be different, and some rugs are printed not dyed. These issues combine to making cleaning area rugs a much different process than normal carpet cleaning. It is important to know that your professional cleaner is familiar with the many different processes required to properly clean your rugs. Fortunately, low moisture cleaning in an excellent process for area rug cleaning. Wool, jute, or other natural fibers respond well to cleaning without being completely soaked in the process. The fact that we use an encapsulant cleaning solution rather than soap is a real plus for your fine rugs. At Crystal Clean Carpets we understand rug cleaning. 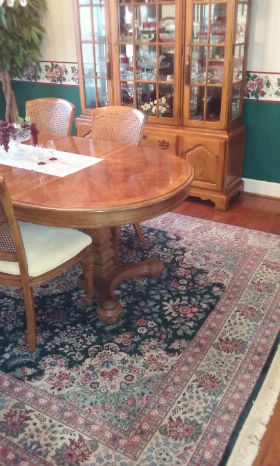 We can professionally clean your rugs without damage and restore their vivid colors. If you have pet stains and pet odors in your area rugs we are experts at dealing with those issues as well. So when you call us to deep clean your carpets, don’t forget your rugs. We can insure that all of your carpets and rugs are clean, beautiful, and ready for years more service. After your carpet and rugs are clean and looking their best, don’t forget to have our best in class carpet protector added to keep them looking great and repelling dirt and stains for many months to come.